Our shear pump reduces the cost of mixing polymers and clays while improving mud properties. Shearing the polymers eliminates fish eyes and prevents polymer chaining (long strings), which cannot pass through the shaker screens. Our shear pump is available as a belt-driven or diesel-driven package including a hopper, mud gun, and transfer line orifice plate. A complete system with skid, tanks, and piping are also available. 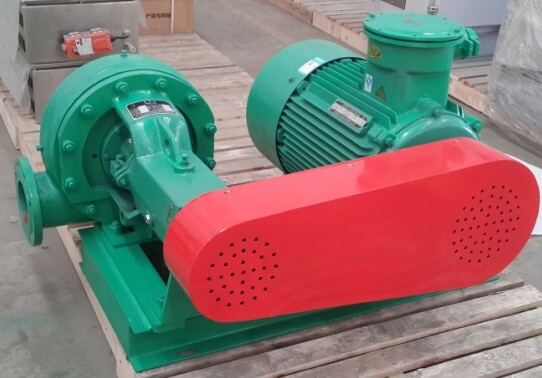 Our Shear Pump impeller is specially designed to have a wider flow pass and smooth vanes, with larger flow area and smooth fluid pass, making the shear pump reach the internationally advanced level in shear pump efficiency and energysaving,10% higher than similar products. The shear pump has adopted a shell thicker than normal one, with rational pass and less turbulence. Our Shear pump Impeller and shell are made of high wear resistant cast irons, with longer servicing life. The shear pump shaft has high strength that can bear certain load, reducing shafts deflection and extending seals service life; The shaft is lubricated with lubricants and lubricating grease and the oil seal is made of special structure and materials, suitable for high and low temperatures and complicated environment; Front opening structure is used for convenient installation, repair and maintenance.